Archbishop J H Abel, leader of an association of Apostolic independent churches on the West Rand, officiating at an ordination service in Soweto. With him is the Revd Brian Brown, adviser to the independent churches for the Christian Institute. Archbishop Abel was about to retire & had asked me to replace him! I declined, but as the association was seeking someone to assist them, I suggested Brian Brown might be able to help. We attended a service in Soweto, where Brian also declined the appointment but offered help. As an ordained Minister he was unexpectedly roped into the service. 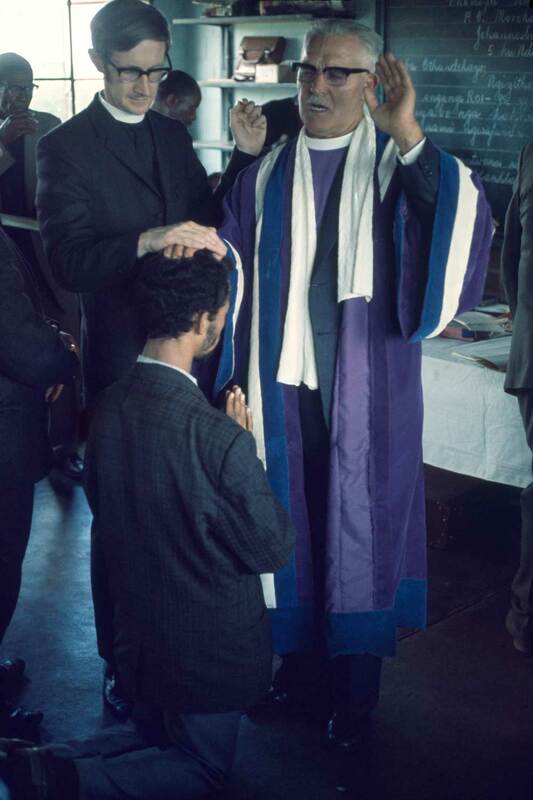 West, Martin, “Leader of association of AI churches Archbishop Abel with CI Reverend Brown officiating at ordination service, Soweto,” Martin West, accessed April 26, 2019, http://www.martinwest.uct.ac.za/items/show/10716.